Jolene Kemen (on the left), who passed away in January, poses with Vicki Stroud at the 2018 Rotary luncheon. Kemen was instrumental in raising funds through the Round-Up’s annual Tough Enough to Wear Pink campaign. Red Bluff, Calif. – The annual Red Bluff Rotary and Round-Up luncheon will be held on Tuesday, April 16, with a new name. 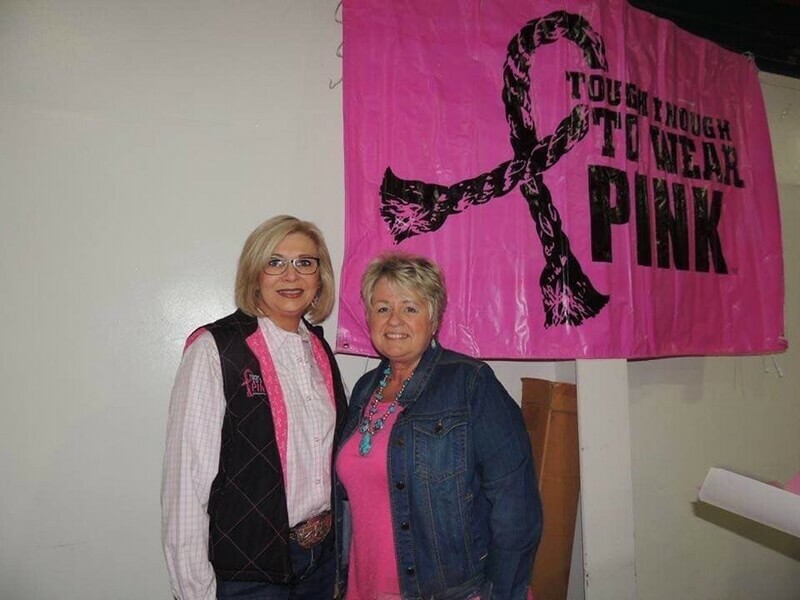 In honor of Jolene Kemen, a Red Bluff Round-Up board director who passed away in January, it will be called the Jolene Kemen Think Pink Luncheon fundraiser, barbecue and auction. It will take place in the cafeteria building at the Tehama District Fairgrounds, beginning at 11:45 am. The luncheon raises funds for the Tough Enough to Wear Pink campaign. Proceeds go to Dignity Health/St. Elizabeth Community Hospital, to be used for people undergoing breast cancer treatment. Vicki Stroud has co-chaired the event alongside Sue Ampi for the past three years, and she is pleased that the event’s new name honors Kemen. At the time of her death, Kemen was the only woman director on the Round-Up board and was chairman of the Tough Enough to Wear Pink campaign. She was generous to those around her. “She was a giver,” Stroud said. “I read a story where she actually took her necklace off and gave it to someone when they complimented her on it.” Kemen donated her time to several organizations. “She was a very giving person, very involved in the community,” Stroud said. A meal of tri-tip will be served at 12 noon. A silent auction will be held, as well as a live auction. Live auction items include meat, Cabernet Sauvignon, a handmade quilt, a pink guitar, a day spa package, a keg of beer with a free growler fill per month for a year, and other items. This year, wine and beer will be for sale at the luncheon, with one hundred percent of sales going to the cause. Live music by Senior Moments will entertain. It was Kemen’s goal for Red Bluff’s Tough Enough to Wear Pink campaign to top a half-million dollars, and Stroud hopes this year it can be done. “Jolene had a goal of $500,000, and when she passed, it was $25,000 shy of that goal,” Stroud said. “We want to exceed it this year.” Funds raised for Tough Enough to Wear Pink come from a variety of activities: the Rotary luncheon, beer sale tips at the Round-Up, the auction of items at the Round-Up on April 21, and others. Tickets are $15 per person and can be purchased at the door, at enjoy The Store, Cornerstone Community Bank, and the Chamber of Commerce.